At the moment, I am working on a lovely commission inspired by the art of South Asia and am working with beautiful blue moonstones, in a variety of shapes and sizes. The blue moonstones were originally part of a bridal necklace, which belonged to a lady called Grace. Grace was a nurse in Ipoh, part of the Malay states and the beautiful antique necklace was made by the Chinese community there. Grace married in 1911 and the necklace was given to her as a bridal gift. The moonstones were very popular during this time and it is rare to find moonstones now a days of this quality. The gold used in the necklace was no doubt recycled, as it has been analysed and more than one carat has been used. If it were to be hallmarked now, it would be hallmarked as nine carat gold however. 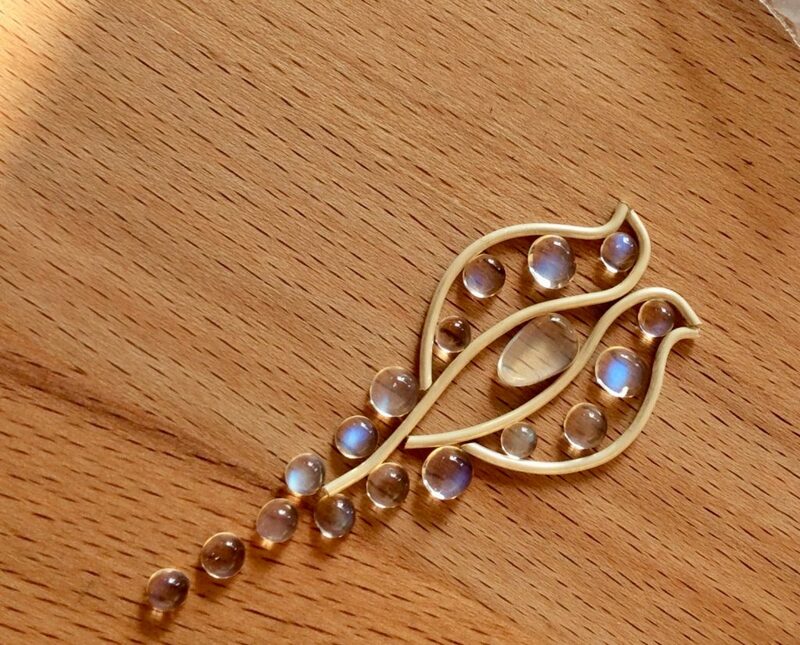 it is a lovely commission to work on as it reveals a family history, which spans over time and takes the moonstones from an antique necklace, which is now broken and puts them into a modern context, which can be passed onto future generations. I have also been given the freedom to create a design from a sketch book of ideas, which I keep and add to.